Oh, by the way, tax season is just winding down to coincide with the winding down of the 2012 Alberta General Election. That’s mostly a coincidence on Red Redford’s part, but its probably more interesting than that. Did you enjoy paying taxes? Did you really enjoy learning that you were paying far more than that assessment you were required to pay? In my case, I have to pay 11.9% of my total tax bill for the end of April. In general, you actually paid infinitely more than your April bill says: many get a refund, mistakenly thinking that they didn’t really pay any tax. Really, they did. You also pay a provincial income tax: again, roughly 3/4s of what you paid federally. 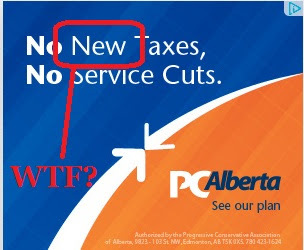 Fortunately, Alberta’s income tax is a flat tax. Of all the forms of tax, the most equitable, as it takes an equal percentage of the hours worked. If you have a flat tax of 10%, then for every 10 days you work, the government seizes one day of those earnings. Whether you’re pulling down Warren Buffet money or Rachel Notley’s immigrant housekeeper money, the amount of your physical labours taken by the Crown is the same. The NDP, and by extension the Red Redfords of the world, don’t think that’s fair. When Brian Mason and Raj Sherman are talking about tax increases, that’s their motivation: fairness. They don’t think that a single dollar of your income is actually yours: they think it’s theirs. Because it’s theirs, not yours, they just need to decide they want it, and they take it. Thursday night on Rob Breakenridge’s evening radio talk show, they had a University of Alberta professor talking tax policy. It’s not mentioned much by the various campaigns, which is a shame: since it illuminates the major difference between the Wildrose and the four left-wing parties: who that money belongs to and who can best spend it. It also, and we’ll get to that, speaks to another lie by Red Redford. This blog talked about this topic earlier this month when the Dani-Dollars were being discussed. With taxes, it’s the same story really: Brian Mason, the man so plum-stupid he doesn’t know that governments run government-run healthcare systems, is confident that if he took all of your income, and all of your neighbours’ incomes, and all of your boss’s income, and emptied out your grandmothers retirement savings, and cleaned out everybody’s bank account, that he could spend that money better than you. Of course, when he talks about wasting it on ineffective hospitals, or incompetent teachers, or lazy unions, you know he’s wrong about that belief. Try telling him that. Try telling that to Red Redford. In fact, Red Redford has increased your tax bill right here in 2012: she increased the education tax that is levied by municipalities. That’s Redford’s tax: the only group that can decide to raise that tax is the Government of Alberta, which Redford runs with an iron fist. She decided that the incompetent teachers (number two on our list) were to be the next recipient of your money: so she decided to give them more. Yes, even more. Now true, this number didn’t get reflected on the taxes you just filled out. Those taxes, the municipal taxes, are due in June. By June, Redford hopes to have her majority government back, her iron fist back in the saddle making laws that make your life worse, and for there to be nothing you can do about it. In fact, she’s hoping that you’ll blame the municipality. They are the ones who by law are to collect this particular tax. Municipalities, which this week have been angry as hell that they may have to deal with the Wildrose party, were rightfully upset about that. What should upset you too is that nobody, not even Danielle Smith and the Wildrose, have been bringing this up, despite being Alberta's only right-wing party. Alison “Red” Redford increased your taxes in the last six months. She’s in ads claiming she’s not raised taxes. She’s lying to you, and you’re letting her get away with it. Replacing her with Danielle Smith is your best chance at getting your tax bill down. You’re going to have to pay more in June 2012. In April 2013, June 2013, April 2014, June 2014, April 2015, June 2015, April 2016, and June 2016 you’ll have to pay more and more and more if Red Redford wins.